Annan, originally a market town, stands on banks of the River Annan in Dumfriesshire, approximately 2 miles from its confluence with the Solway Firth. Nowadays only a few stranded fishing boats can be seen on the river but Annan was once an important trading port and shipbuilding centre that produced a variety of vessels including coastal brigs, two-masted schooners and sloops. Prior to the advent of the railway the region`s vessels carried goods from Annan and the other ports on the Scottish side of the Solway to destinations such as Liverpool and the towns of Whitehaven, Maryport and Silloth, on the Cumbrian coast. Some larger Annan-based vessels crossed the Atlantic to Canada for timber and salted fish during the summer months and in the 18th and 19th centuries Annan was also a major point for emigration to the New World. Like many of the neighbouring Solway ports, Annan was once a haven for smugglers and a cairn on the town`s jetty commemorates Robert Burns who worked in the town as an exciseman in the 1790s. Magnus, below, is a forlorn looking Tug that has been anchored at the dockside in Port Street for some time. 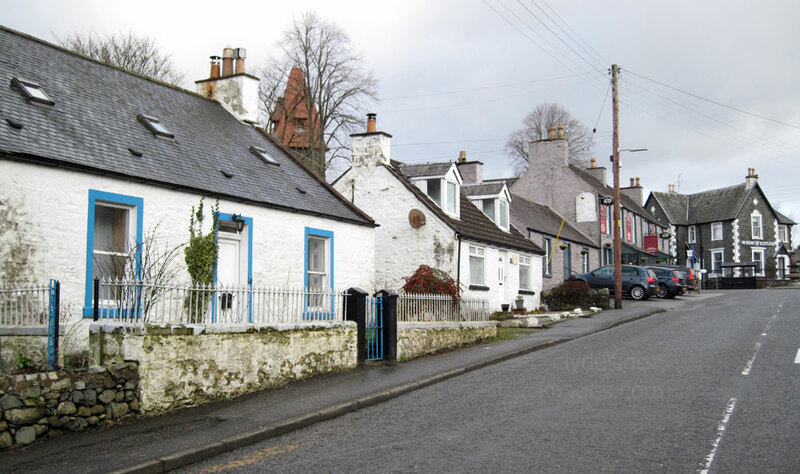 Auchencairn is a traditional Scottish village in Dumfries & Galloway consisting of mostly whitewashed stone houses that date from the early 17th century. 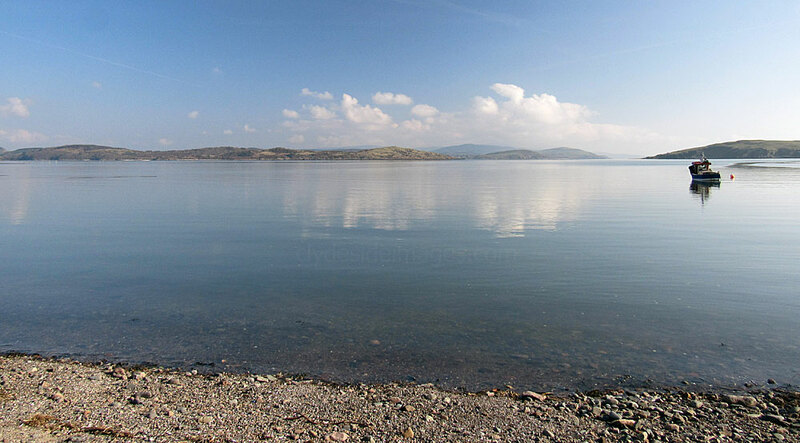 It is located on the heritage coastline of the Solway Estuary, close to picturesque Balcary Bay (below). 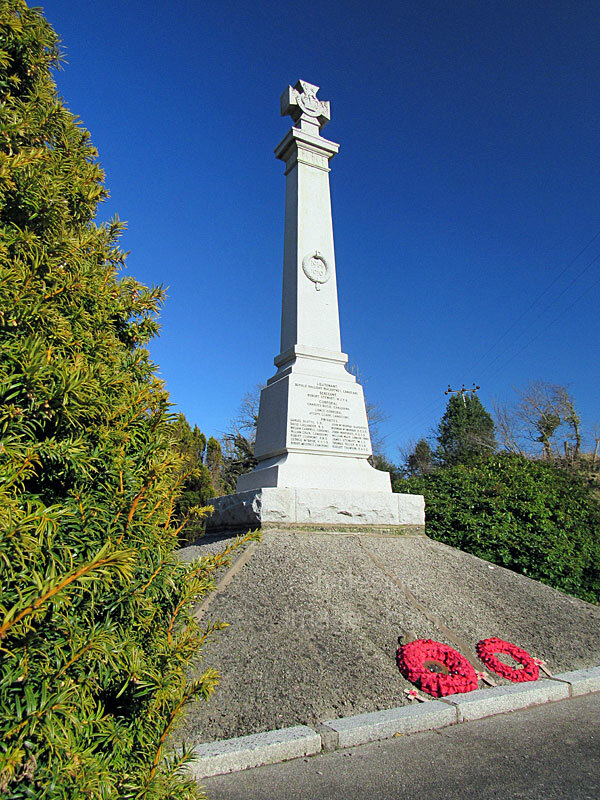 The village war memorial is on the A711 Dalbeattie to Kirkcudbright coast road and stands immediately after the hump-back bridge as you enter Auchencairn from the east (Dalbeattie). The walled gardens in which the memorial stands are a blaze of colour in summer. 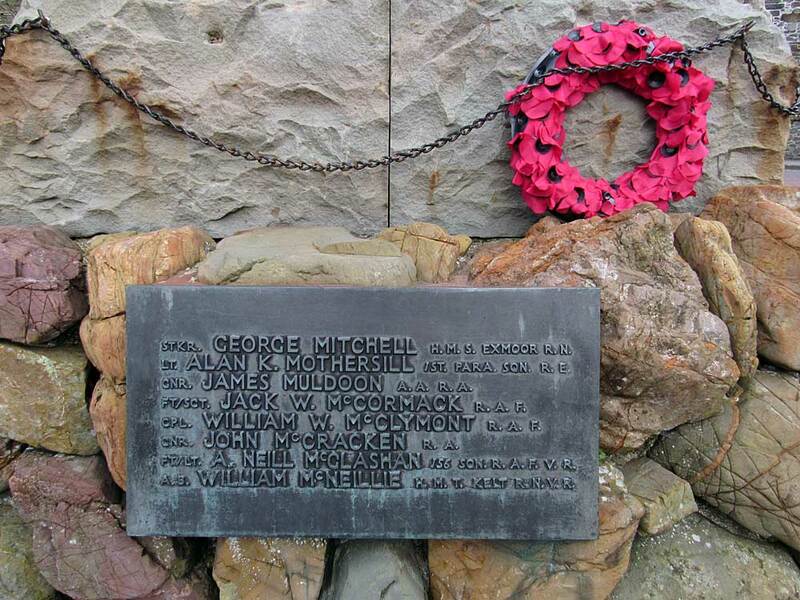 Sculpted from Aberdeen granite, the memorial was designed and produced by Messrs William Kirkpatrick Ltd. of Manchester, England, and weighs seven tons. 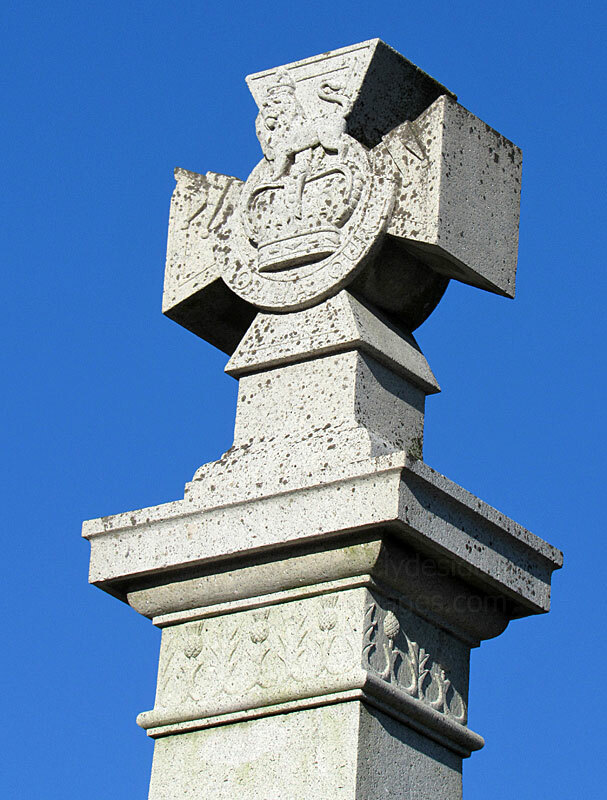 Somewhat unusually the finial atop the plinth takes the form of the world famous Victoria Cross medal. 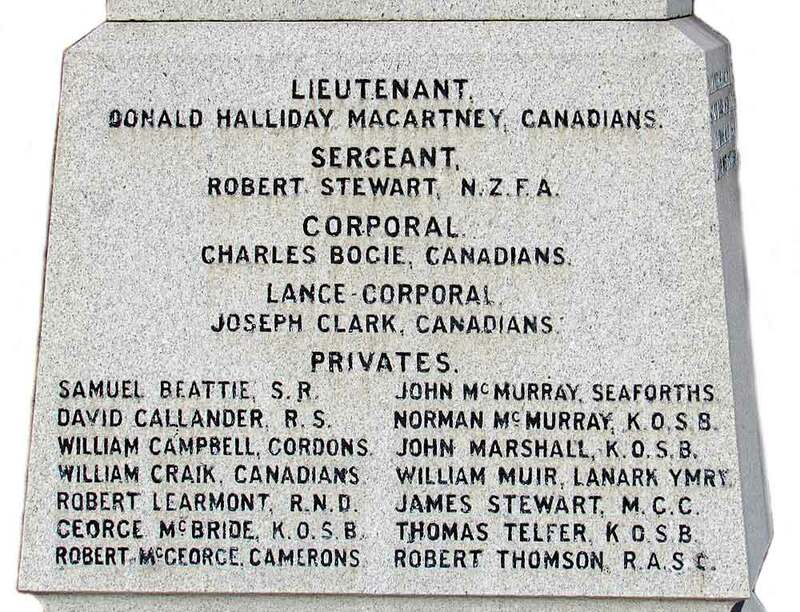 The memorial was unveiled before a large gathering on the afternoon of Sunday 22 August 1920 by Colonel of the Black Watch Victor M. Fortune, D.S.O. 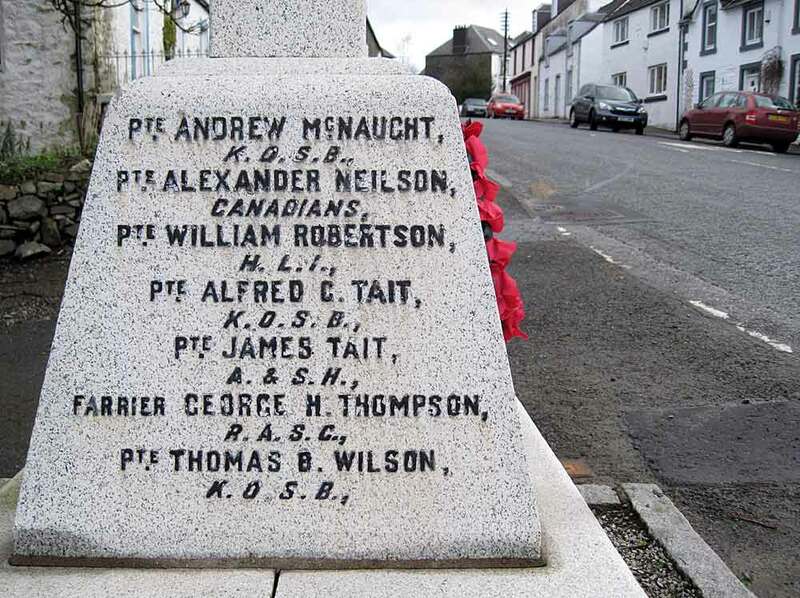 Mr Andrew Muir, M.M., an ex-Corporal, 1/9th (Glasgow Highlanders) Highland Light Infantry, laid a wreath on behalf of the local branch of Comrades of the Great War. 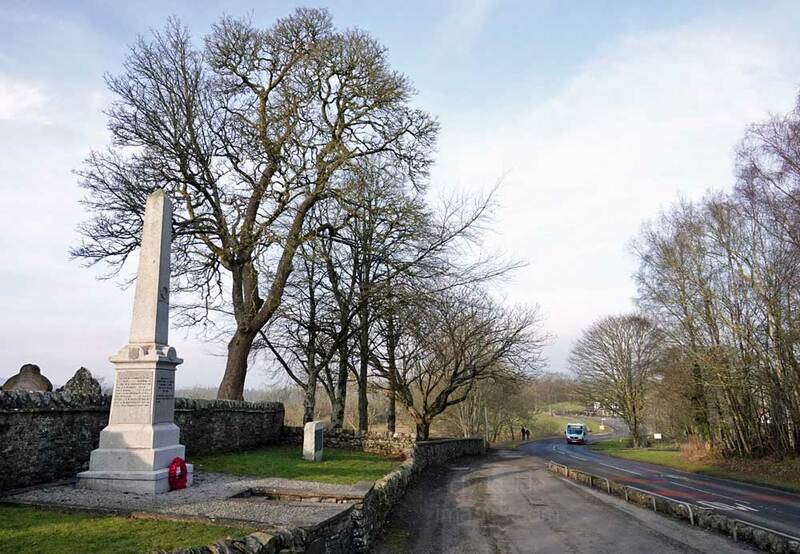 Eighteen men who died serving their country during the Great War are listed on this memorial and research has revealed that a further 14 men with connections to the village are commemorated on other war memorials. 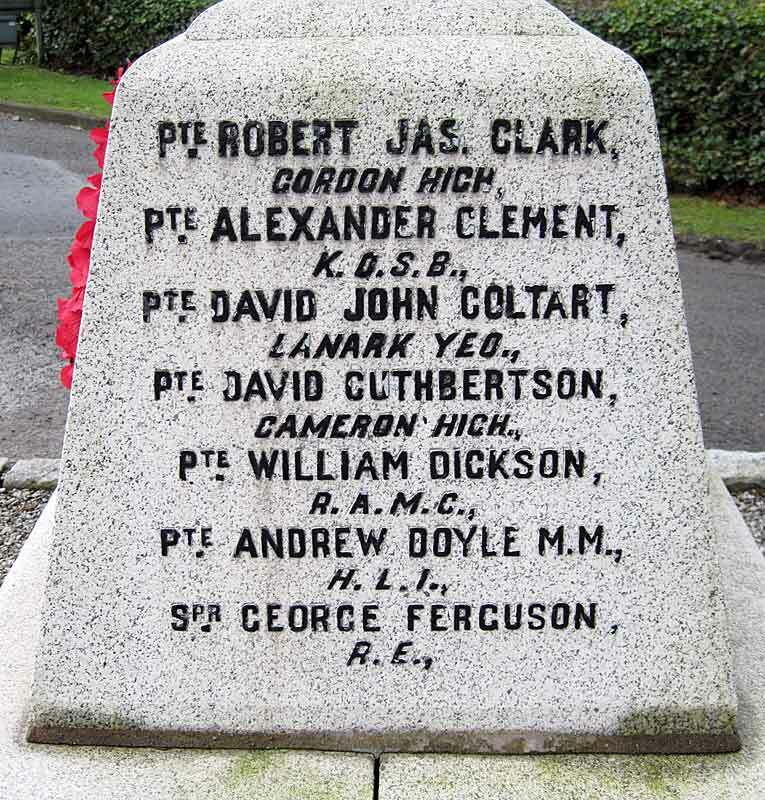 ​The names of four local men who died serving during World War 2 were subsequently added to the Roll of Honour at Auchincairn. Carsphairn is a village in the Dumfries & Galloway region, located about halfway between Dalmellington and St. John's Town of Dalry, on the A713 road. 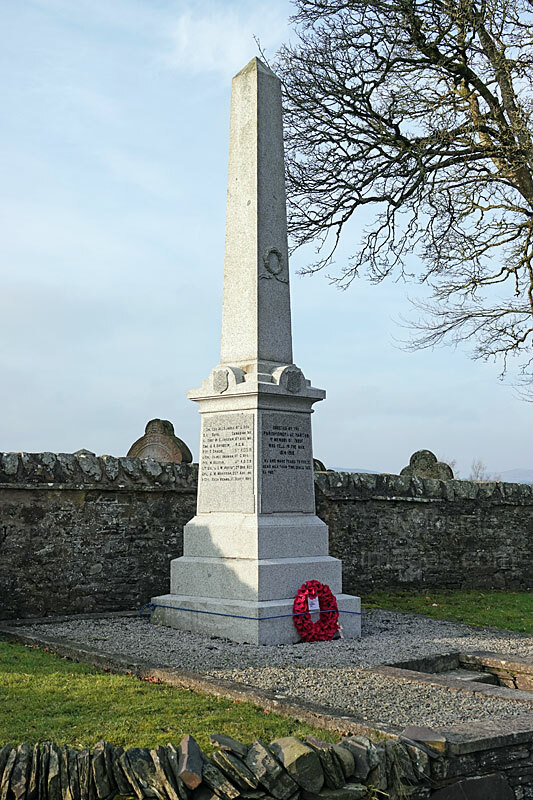 The war memorial, which stands to the south of the village, was designed by Captain John W. Dods of Dumfries, and erected in memory of the men from the parish of Carsphairn, Kirkcudbrightshire, who fell in the Great War. The memorial was unveiled by Colonel William H. Clark Kennedy, V.C. (Canadians), a native of the parish, who came all the way from Montreal to perform the ceremony. 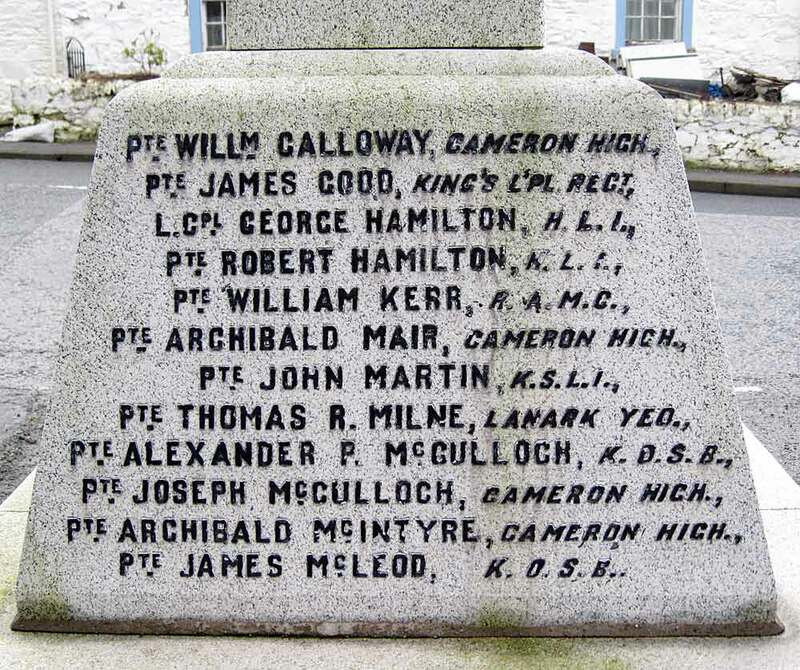 ​The graves of two of those men listed can be found in Carsphairn churchyard. 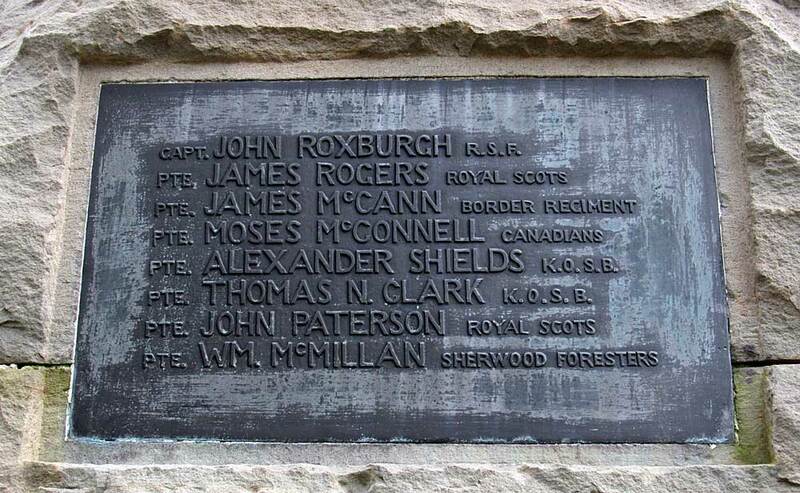 A plaque was subsequently added to the base of the memorial to commemorate three local men who lost their lives in WW2. The Heritage Centre is reportedly worth a visit. Although small, the interior has numerous items of interest and information on local characters including one from the Kennedy family who captured a French Flag at the Battle of Waterloo and William H. Clark Kennedy V.C. 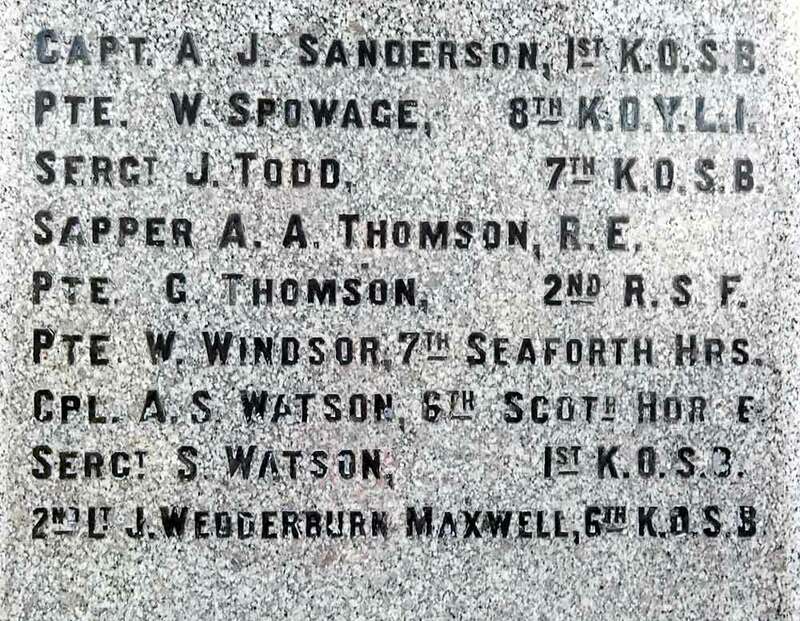 who unveiled the village war memorial. As of 2018, the centre should be open Friday to Monday inclusive, from 30th March to the 30th September and the public toilets outside are usually open all year round. More information including on the Heritage Centre and other aspects of life in the area can be found on the village website: www.carsphairn.org/. 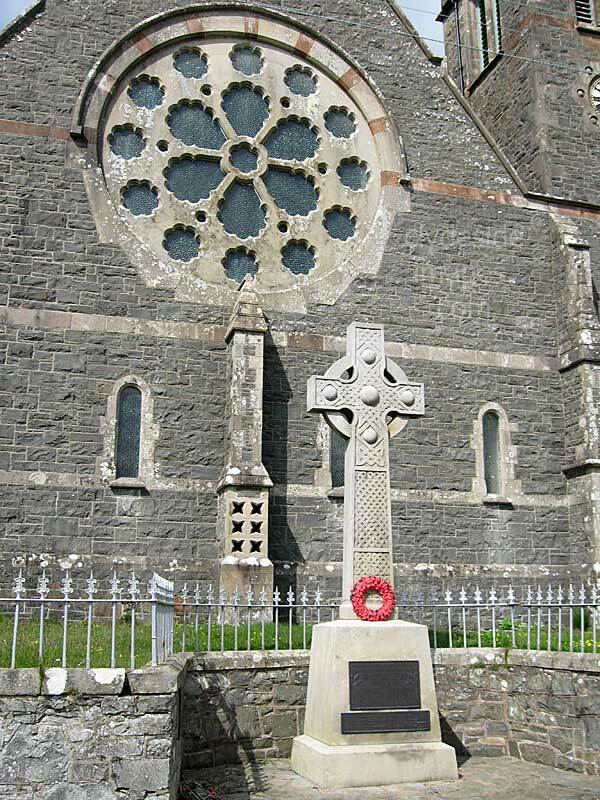 This is the Dundrennan War Memorial which sits outside the village church on the opposite side of the road from the atmospheric ruins of Dundrennan Abbey. 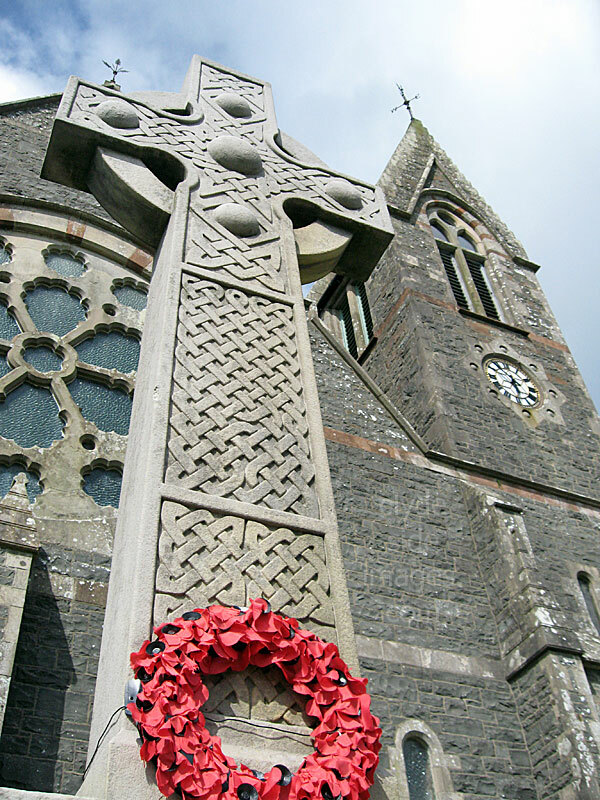 The memorial commemorates the men of the Parish who were killed during the First World War. 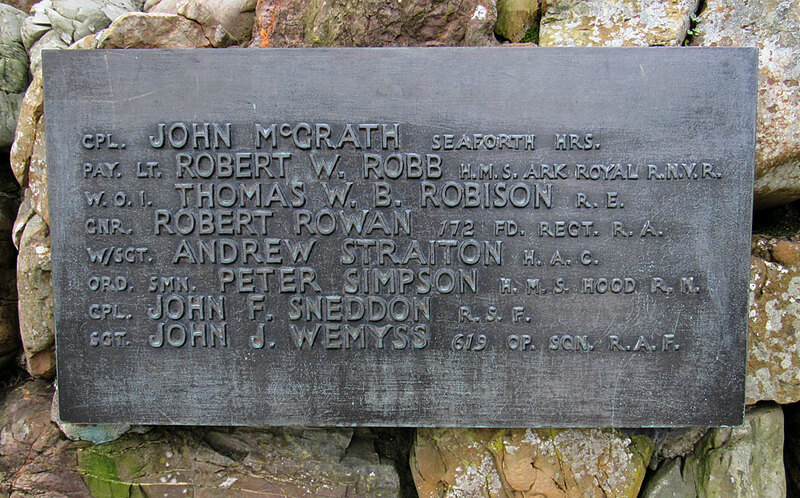 An additional panel was added listing a further six names of man who died during World War Two. 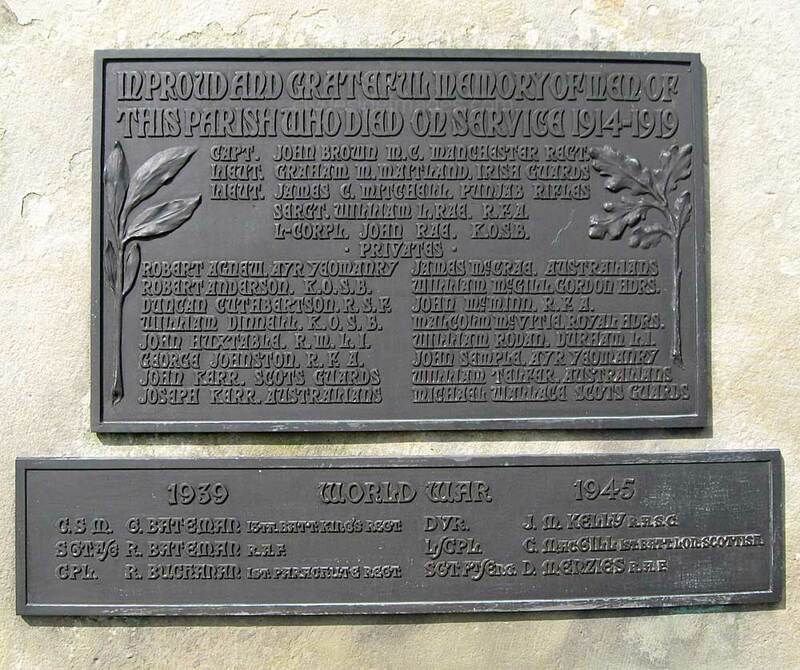 A plaque (below right) on the low wall beside the war memorial commemorates a tragic air crash which occurred in the village during the Second World War. Whilst on a night sortie, an RAF Beaufighter XI, serial number JL893 of 9(C)OTU Carlisle, came down around 01:15 hrs close to the village school. Although the initial impact was in a garden at the rear of the main street, the aircraft`s momentum carried it through one of the houses before it finally came to rest against the school wall. The house was completely destroyed and several adjacent buildings, including the school, which was set on fire when the aircraft`s fuel tank exploded, were extensively damaged. 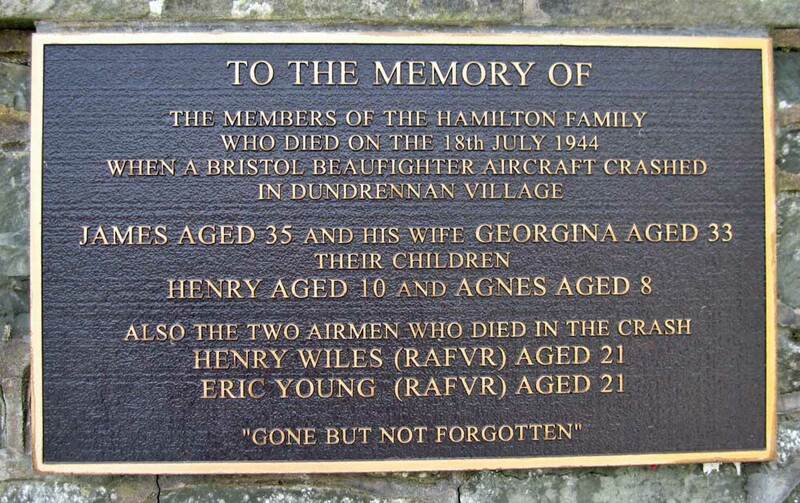 Both crew were killed outright: Pilot 1459184 Sgt E M Young RAFVR (21) and Navigator, 1600998 F/S H A Wiles RAFVR (21). 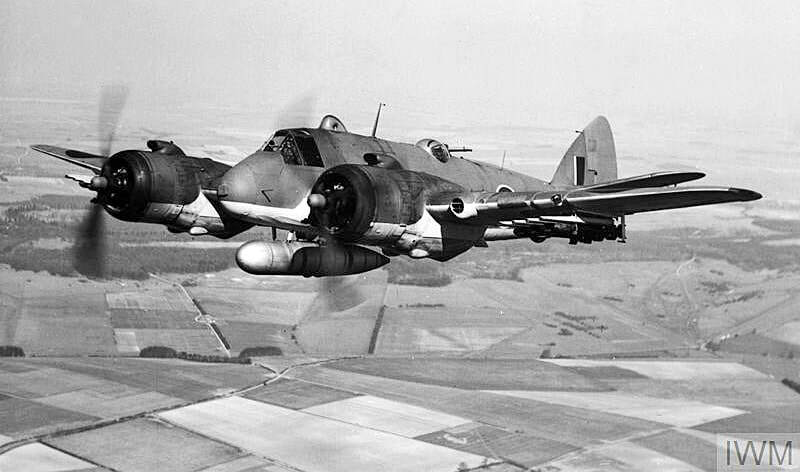 This shot shows a Beaufighter TF MK.X which was similar to the aircraft involved. ​The first emergency responders reached the site to find the aircraft was still on fire, and that four civilians were also dead. The house where the Hamilton family died, which lay close to the war memorial, was never rebuilt. 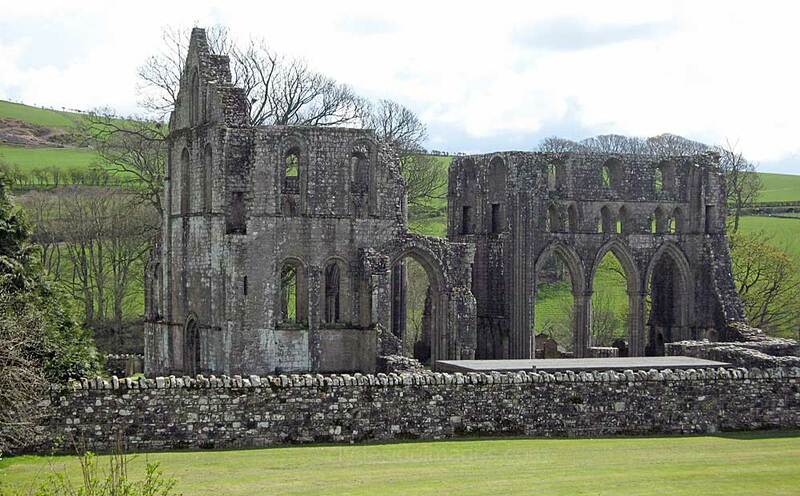 A number of other graves commemorating men lost in action in earlier conflicts lie in the graveyard of Dundrennan Abbey. 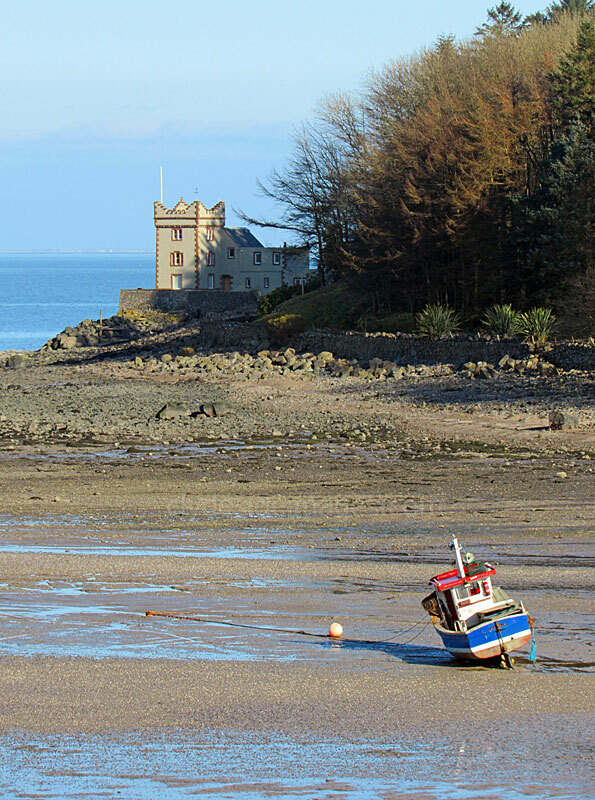 Kirkcudbright lies on the estuary of the River Dee, on the north side of the Solway, in South-West Scotland. 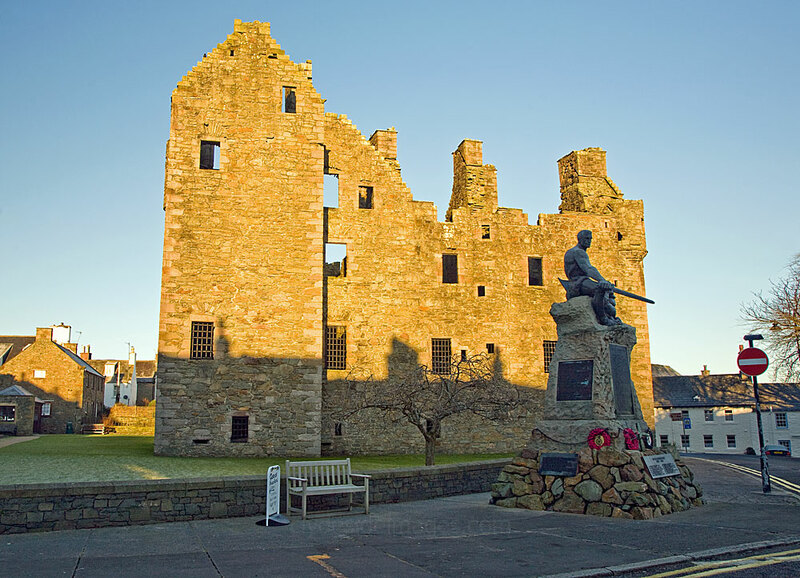 The original town was built around the old High Street where many old houses still survive and it makes an interesting place to explore with various points of interest including a striking war memorial and ruined castle. Although the largest vessels to be found in the estuary nowadays are fishing boats, in the 1950s coasters and fairly large tankers would drop anchor here. The sheltered location, with easy access to the mouth of the Firth and open sea beyond made the settlement an important fishing port and trading centre. It is thought that Kirkcudbright may have been designated Royal Burgh status long before it was first recorded as such in 1455. MacLellan’s Castle stands in the centre of town, and although ruinous, it is substantially complete internally apart from its roof, fixtures and fittings. The 16th century L-plan tower house, is named after Sir Thomas MacLellan of Bombie, the then provost of Kirkcudbright who commissioned the building as his new residence. The ground floor contains the kitchen and storage cellars with the family rooms, approximately 15 in number, on the upper floors. Taking up much of the first floor is the great hall, with a capacious fireplace which has a hidden `lord`s ear` (or `laird’s lug` in local parlance). This allowed the master of the house to position himself in a hidden closet and eavesdrop on those gathered in the great hall. 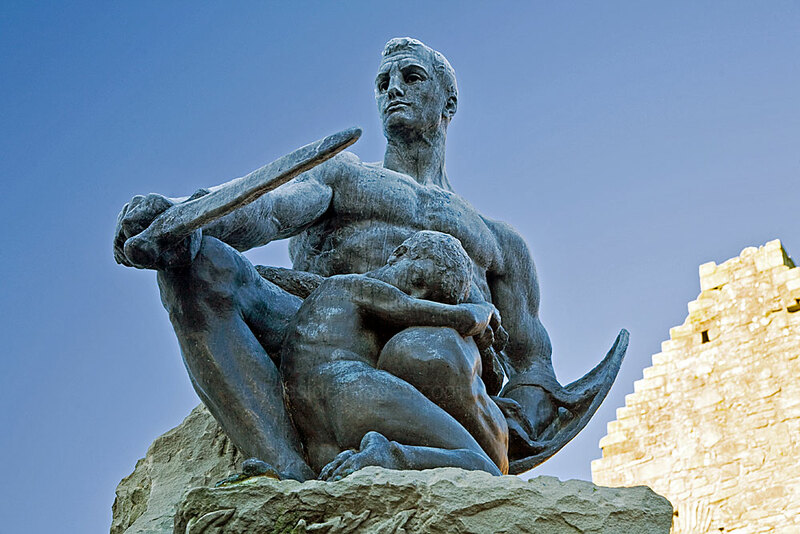 The ruined castle acts as a backdrop to the town`s war memorial which was unveiled in 1921. 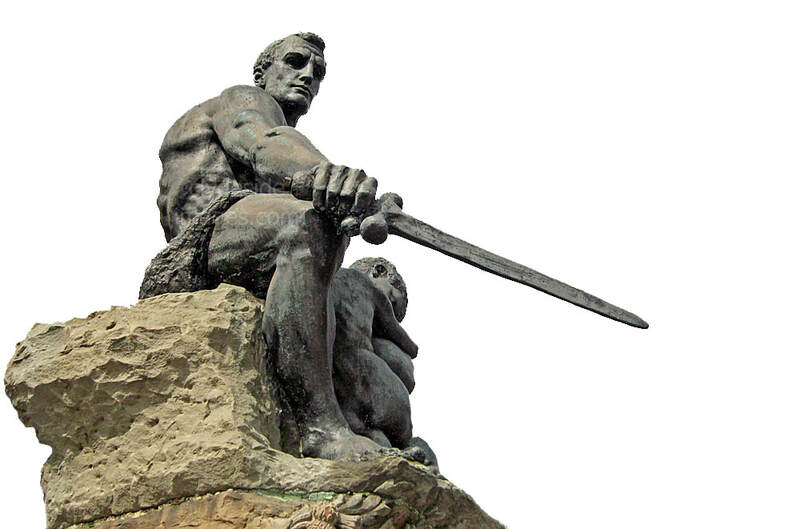 It is just one of many Great War memorials by the acclaimed Scottish sculptor and artist George Henry Paulin (1888-1962), more commonly known as Harry Paulin. 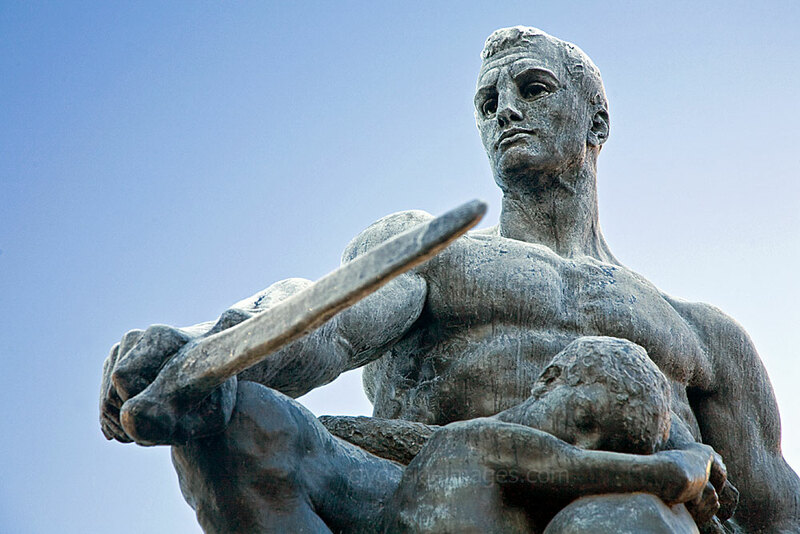 The bronze figures on top of the stone base are of a warrior holding a sword and shield protecting a sleeping child. 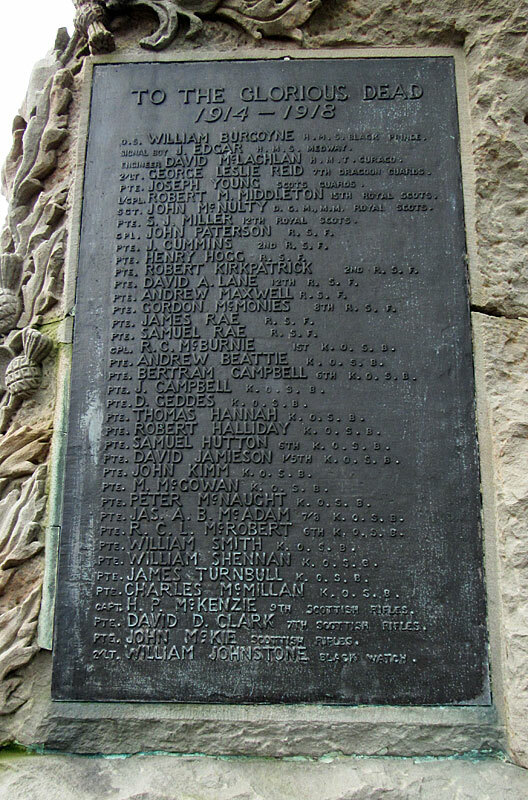 Panels on the memorial`s base list 88 names from the First World War and 36 who fell in the Second. Paulin was born in Muckhart, Clackmannanshire, and his artistic talent became apparent while he was a pupil at Dollar Academy. He went on to study at Edinburgh College of Art where he gained a diploma in sculpture, as well as a travelling scholarship to Paris and Rome. 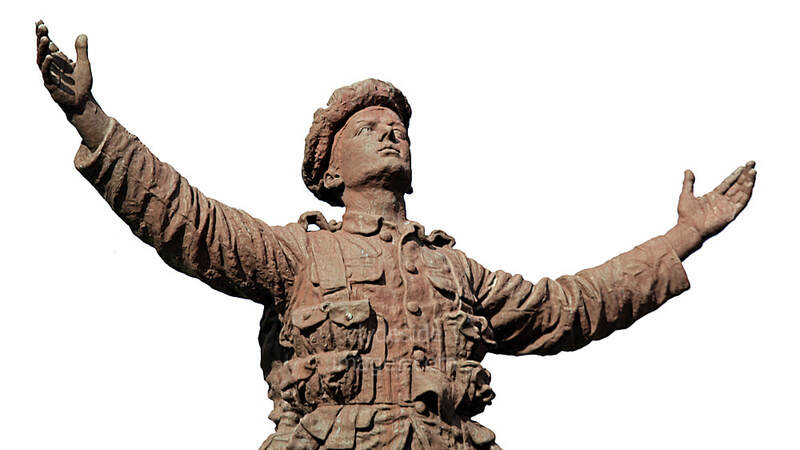 When the War finally ended talented sculptors were in great demand as memorials were being erected all over the UK and abroad to honour those who gave their lives during the conflict. 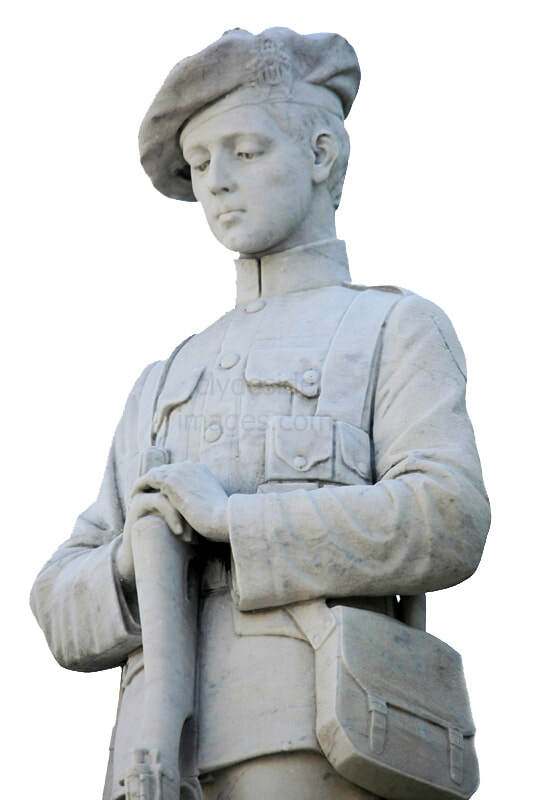 In 1919, Paulin set up a studio in Buccleuch Street in Glasgow and received numerous commissions for war memorials, the one at Kirkcudbright being one of his first major works. Rather than mark his sculptures with his full name they were usually just signed `GHP'. 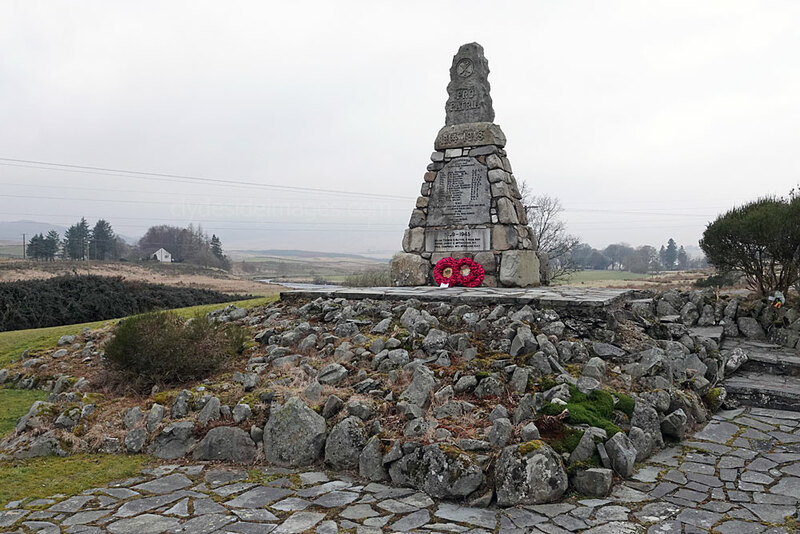 The Lochmaben War Memorial is located beside the junction of Lockerbie Road (A709) and Annan Road at the south end of the town, close to Castle Loch. 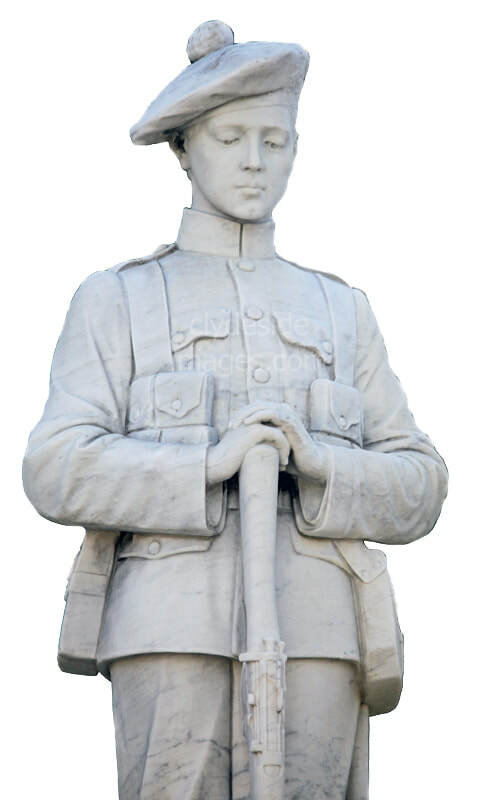 The figure, carved in white, depicts a youthful soldier of the King`s Own Scottish Borderers (KOSB) and stands within a small walled area backed by tall trees. A floral border adds colour in springtime and summer. 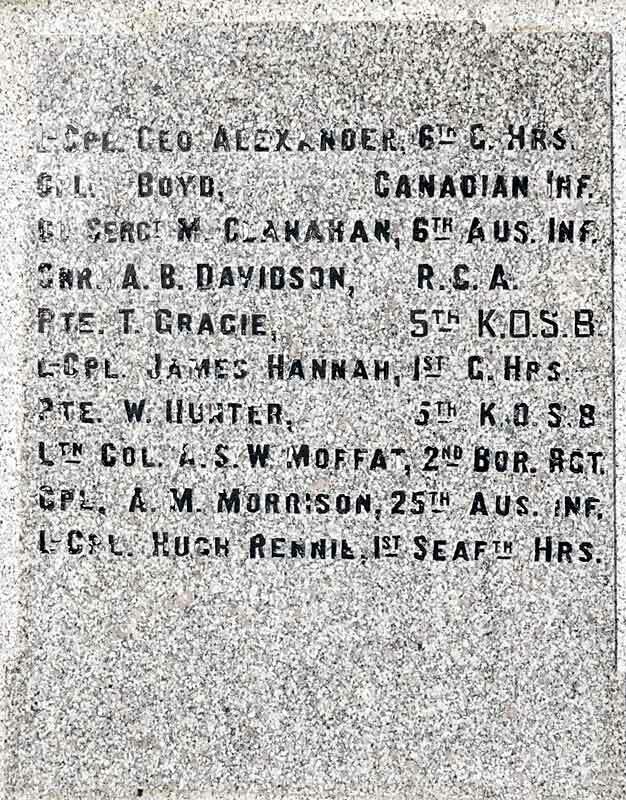 The memorial, by Beattie & Co, was unveiled on 2 November 1921 lists the Fallen from the Great War. 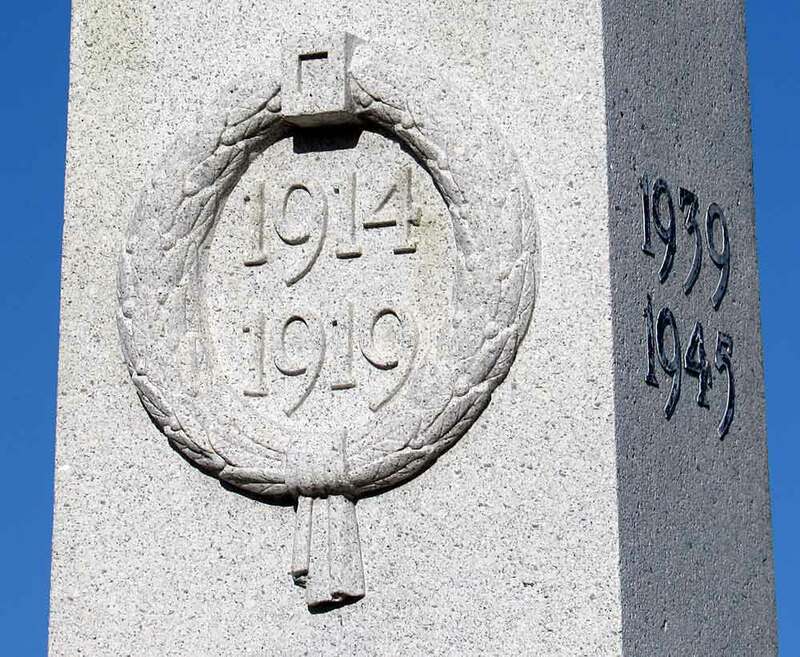 An additional panel was added to the base of the memorial after World War 2 to commemorate the men and two women from the Parish who died serving their country in that conflict. 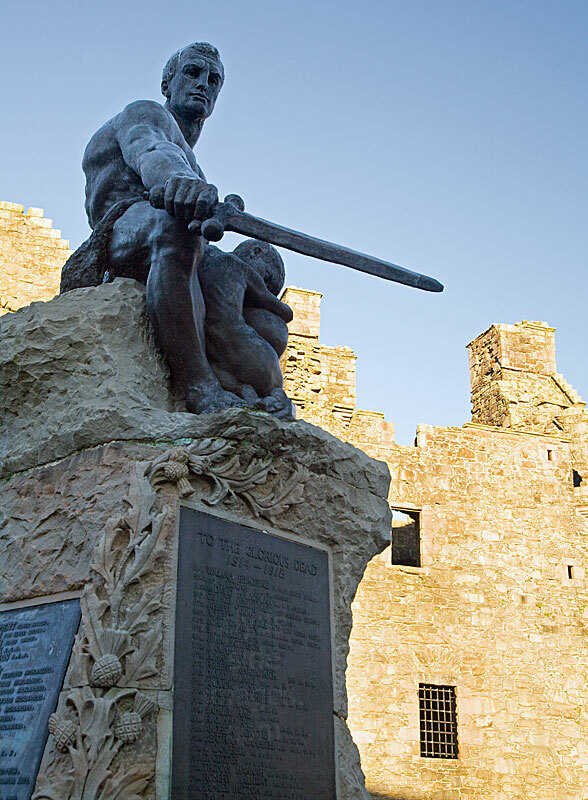 A statue of King Robert the Bruce also stands in the town. 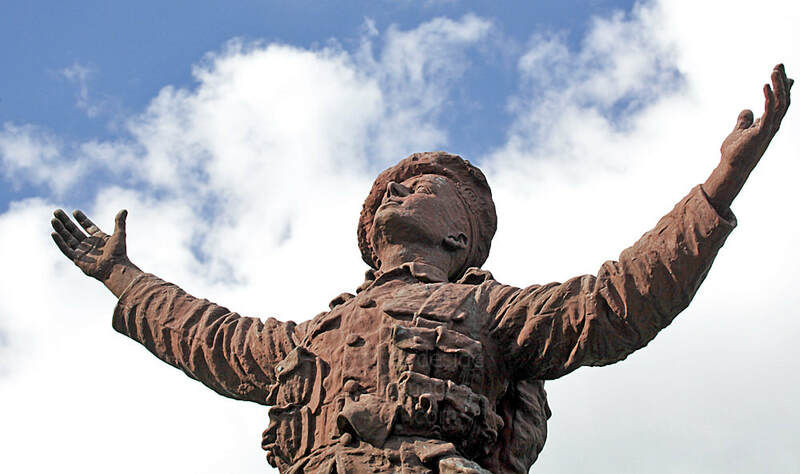 ​This is the striking Maxwelltown War Memorial which stands at the junction of New Abbey Road (A710) and Rotchell Road, Dumfries, on the Solway Coast route. 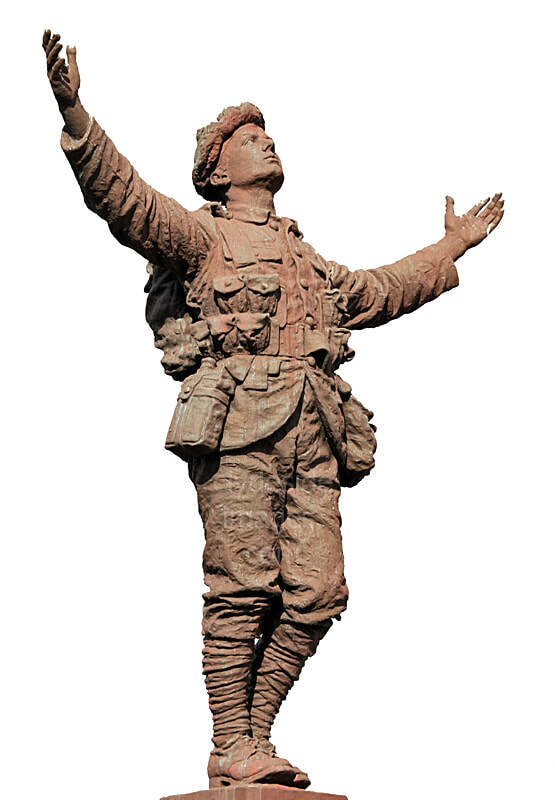 The figure`s sculptor was Welshman Henry Price who was responsible for a number of fine war memorials including the one at Annan. 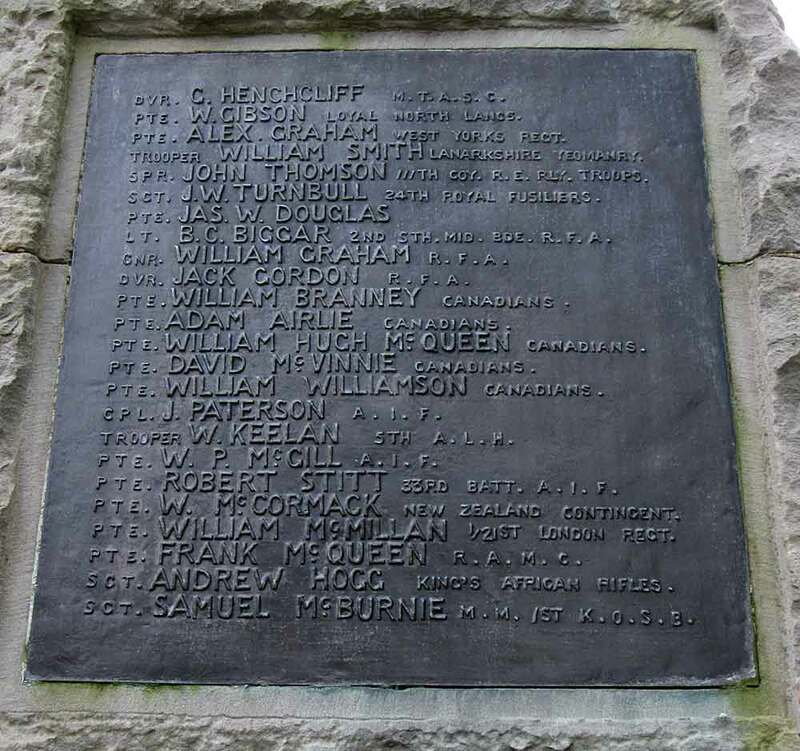 Somewhat unusually, no names of casualties from the Second World War have been added to the Maxwelltown memorial as, following regional boundary changes, those service personnel who died in the later conflict were recorded on the main Dumfries War Memorial. ​The village of Parton is located in Dumfries and Galloway on the banks of the River Dee and despite the settlement`s fairly remote location it had its own railway station which was part of the Portpatrick line, but this closed in 1965. 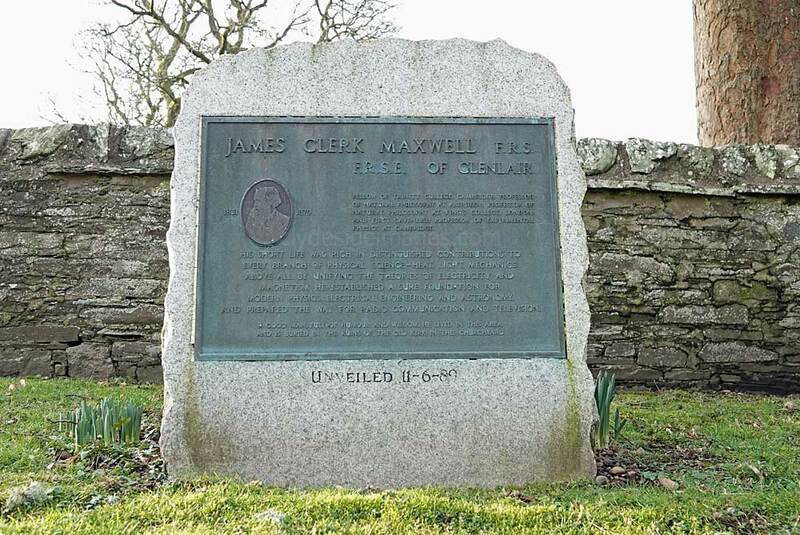 Parton`s main claim to fame was that the prominent mathematical physicist James Clerk Maxwell (Born Edinburgh, 13 June 1831 – 5 November 1879) lived at nearby Glenlair House. He was famous for developing formulae governing electricity and magnetism, as well as the Maxwell distribution in the kinetic theory of gases. 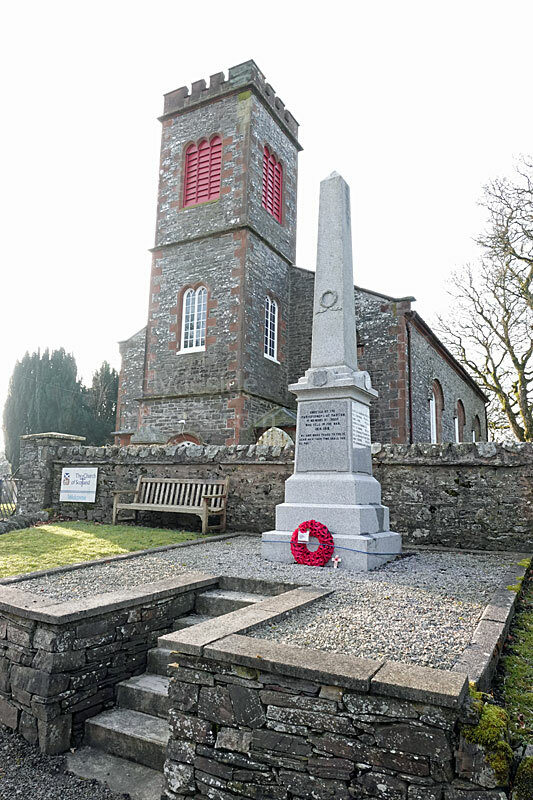 ​Maxwell is buried under the family gravestone in Parton Kirk, to the south of the village, and is commemorated by a monument beside the war memorial, directly in front of the church. ​Also buried in the kirkyard is Elma Yerburgh (1864–1946) who belonged to the Thwaites Brewery family from Blackburn, Lancashire. She lived at nearby Barwhillanty. 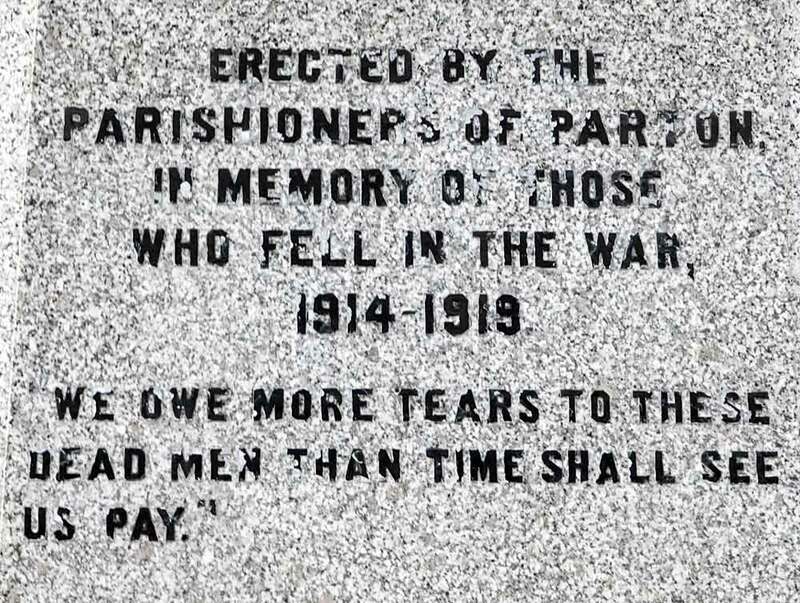 An inscription on the War Memorial reads "We owe more tears to these dead men than time shall see us pay." St. John's Town of Dalry, usually referred to simply as Dalry, is a village in Dumfries and Galloway, and shouldn`t be confused with the small town of Dalry which lies in the Garnock Valley in Ayrshire. 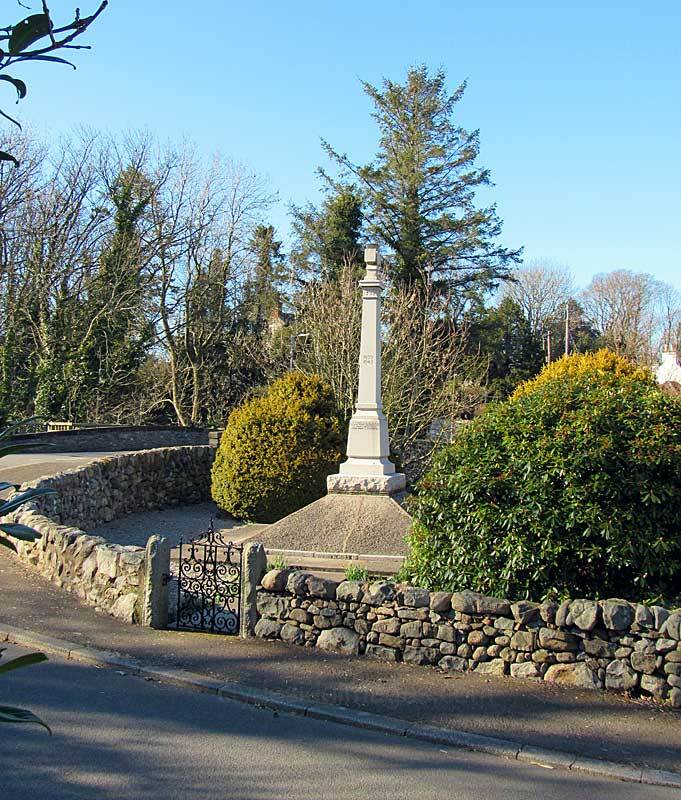 The village, which formerly in Kirkcudbrightshire prior to regional boundary changes, is named after the Knights of St John and is located on an old pilgrimage route to Whithorn and St Ninian's Cave. 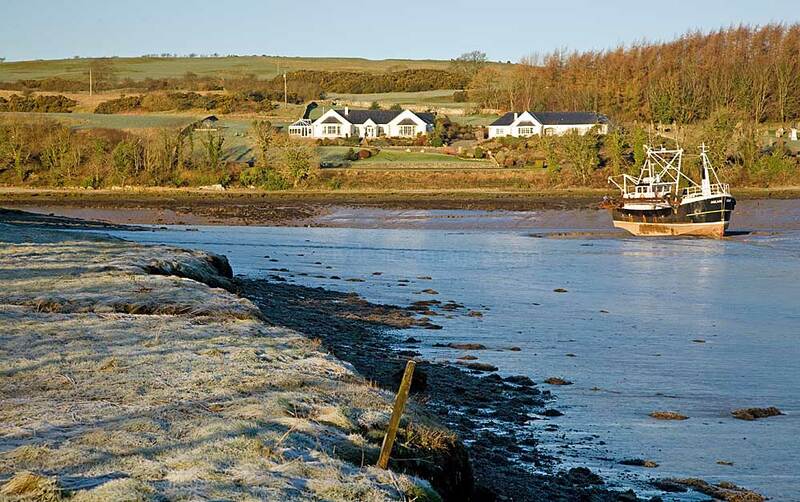 The surrounding area is rich in wildlife and the village, which overlooks the Water of Ken , is close to the RSPB reserve at Loch Ken and the excellent Red Kite viewing facility at Bellymack Farm. 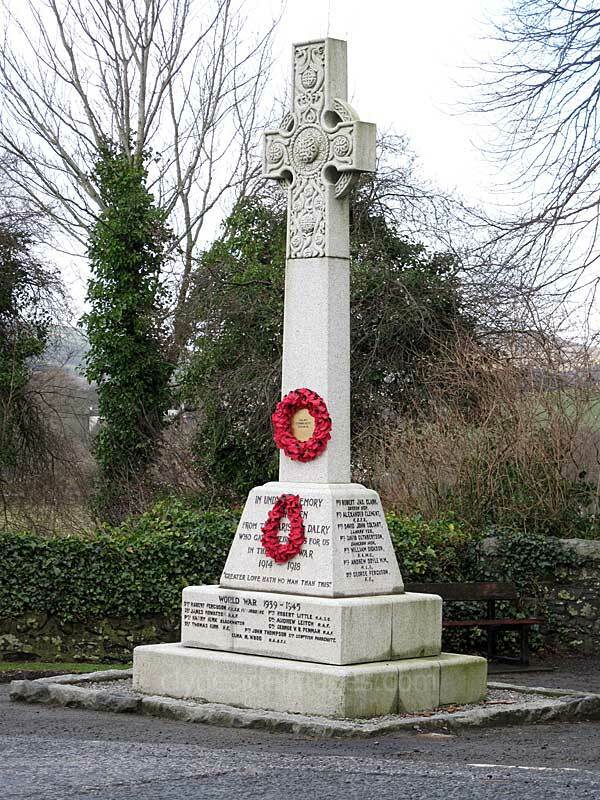 ​This war memorial, in the form of a Celtic cross, stands beside the main road through St John`s Town of Dalry, outside the village church. 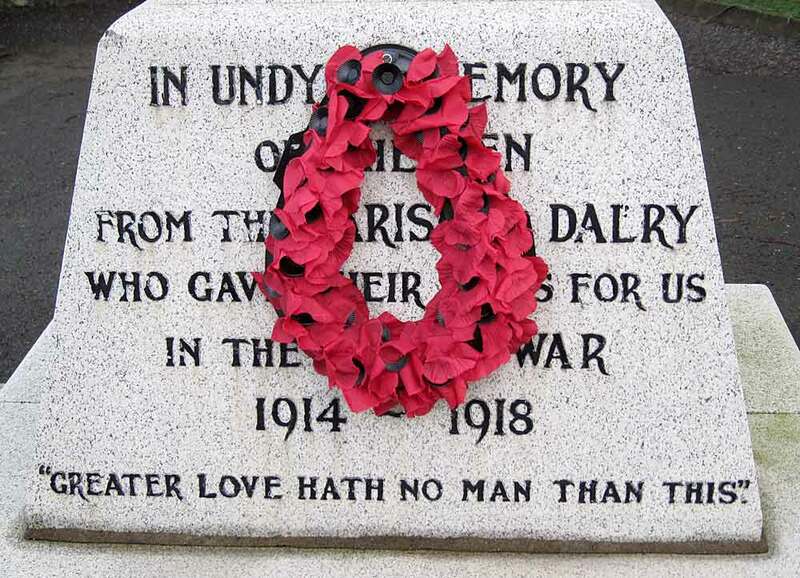 It lists the names of service personnel from the parish and surrounding area who lost their lives during the First and Second World Wars. 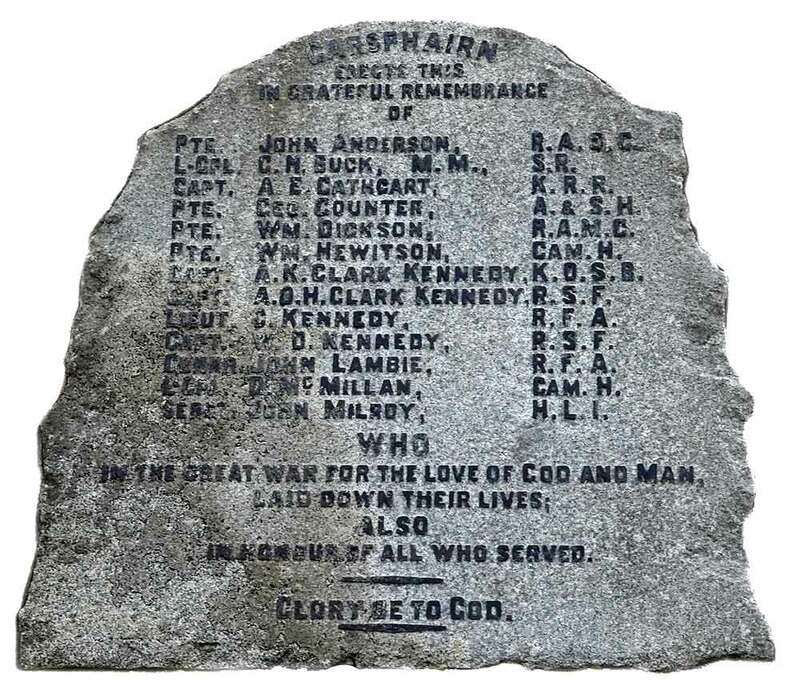 Additional war related graves can be found within the kirkyard. 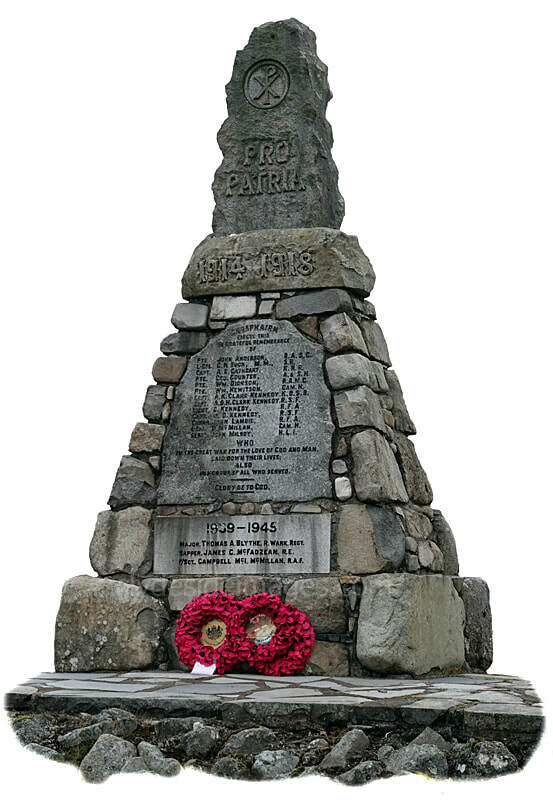 The memorial, made from Creetown granite, was designed and sculpted by Mr R. W. Mackenzie of Newton Stewart. It was unveiled on Sunday 11 September 1921.